1. 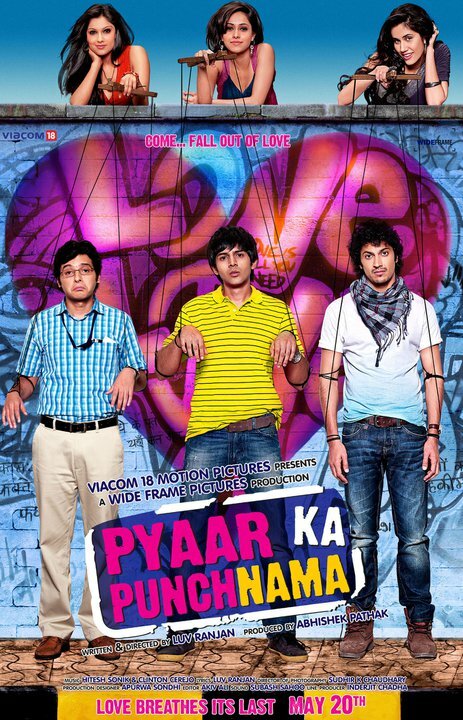 Pyaar Ka Punchnama: The year’s sleeper success that kept us awake for a good 2 hours with its celluloid anthem of ribtickling misogyny. Three room-mates and their troubled love relationships formed the core of the comic conflict. Every character and each episode spilled over with a delightful déjà vu. Debutant director Luv Ranjan managed a 3-guys-in-a-sexist-soup comedy much better than Madhur Bhandarkar in Dil To Bachcha Hai Ji. And the director did it with untried actors. Kartik Tiwari(who is now doing the same director’s nextSaathi) and Divyendu Sharma(who is in David Dhawan’s Chashme Buddoor) were among the best discoveries of the year.We luv you,Luv, for bringing push to shove without tripping over. 2. Zindagi Na Milegi Dobara: It never rains in Spain except when three friends take off on a holiday to the country, to do the things they always wanted to(but were afraid to ).Zoya Akhtar’s anthem to human dreams and aspirations did what Rakeysh Omprakash Mehra’sRang De Basanti had done 5 years ago. It prompted the junta into a spiritual awakening.This time the candles were being lit not at the Gateaway of India but in thousands of hearts. After seeing the film people actually went and did what they always wanted to.Incredible! 3. Shor In The City: Gritty, witty and pithy this one paid a homage to the city of Mumbai through three inter-connected stories that jumped the gun, literally, firing salvos at conventional storytelling techniques while creating a language that was cohesive in its own disembodied way.Does that make sense? 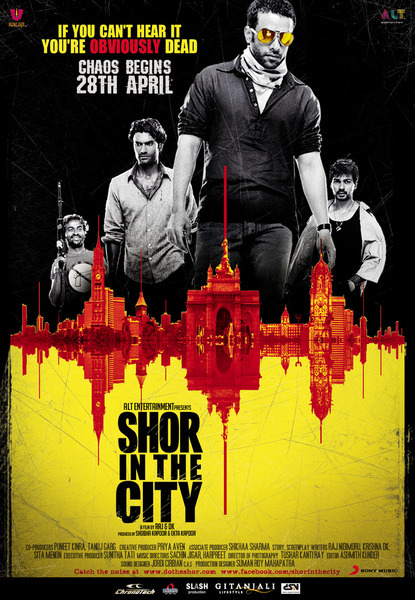 Shor In The City’s directorial duo Raj Nidimoru and Krishna DK tried to make sense of the chaos of the city without resorting to exaggerations and gimmicks. And a whole of lot dark humour.Uniformly competent performances added a sheen of excitement to this on-the-edge drama-thriller. 4. Rockstar: As Jordan the rockstar from Pitam Pura(if that isn’t a contradiction in terms, what is?) Ranbir Kapoor sold his soul to a film that seemed to revel in the ripples of Rahman’s rock rhythms. Yes, the narration lacked a cohesive sense of purpose and seemed to drift in as many directions as the protagonist’s music took him.We were finally left with a film that worked for its middle-pitch rendering of a musical symphony on the artiste as a selfdesructive creature. Ranbir played Devdas on acid. And it worked. 5. Shaitaan: Debutant director Bejoy Nambiar’s clenched tooth-edged look at one night in the lives of a bunch of selfdestructive upperclass kids in Mumbai. Adrift and hedonistic the portrait of self-gratification was dead-on. Nambiar plunged into the lives of his characters with unapologetic gusto, bringing to the surface the harsh reality of lives lived on the brink of destruction.Convincing performances, a fabulous script and an editing pattern that didn’t celebrate abstrusness Shaitaan brought the devil out of the closet straight on screen. 6. Tanu Weds Manu: Those who couldn’t digest the over-sweetened level of shaadi-video in Sooraj Barjatya’s Hum Aapke Hain Kounbreathed a sigh of relief when Aanand Rai (a late bloomer for sure! )came forward with a film that made the festivities and flirtation during a typical North Indian wedding actually seem pleasant and enjoyable.And the small towns of North India never looked more inviting.Give or take a wedding card. The narrative meshed the Madhavan-Kangna relationship into acres of music masti and other diversions without flirting with frivolity. No mean achievement. 7. 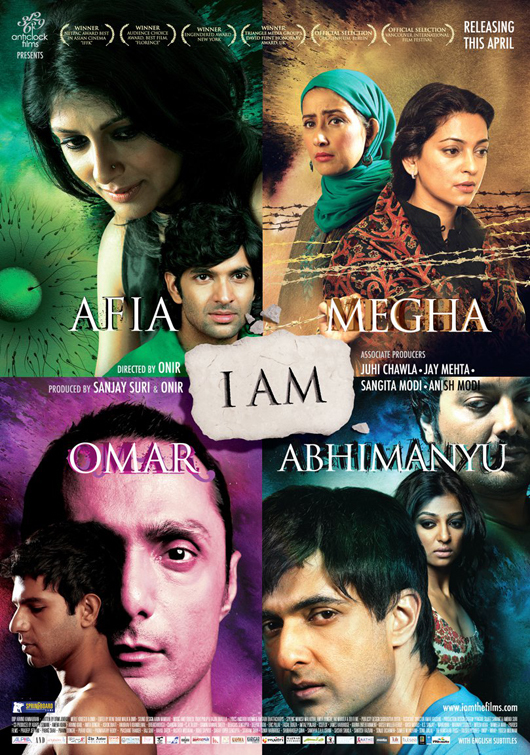 I Am: Onir’s segmented and layered, gentle sensitive and hardhitting 3-in-1 package about fertility clinics, police harassment,Kashmir militancy, child abuse and alternate sexuality provided a revealing view into contemporary life. Not allowing the narrative to be crowded with ideas , not leaning excessively on social statements , the stories in I Am flowed in a smooth motion of life.Fluently. 8. Stanley Ka Dabba: For the sheer happiness of watching a film that walks with the child and doesn’t talk down to him,for the sheer relief of hearing an original voice in the gaggle of derivative children’s films, Amol Gupte’s debut film scored high marks. And for making little Partho Gupte and his friends act and react the way children in real life do we will be eternally indebted to the director.This one tugged at our heartstrings without playing the violin. 9. No One Killed Jessica: A sensational true-life crime brought alive on screen with the deft delicacy of a chef slow-boiling a delicate digestible meal, this one was a class act. Recreating the events around Jessica Lal’s murder director Rajkumar Gupta also fashioned the ultimate chick flick with Vidya Balan and Rani Mukherjee putting in super bravura performances.It’s hard to make a watchable feature film out of a real-life incident. This one managed just that. With resounding success.Jessica lived again. 10. The Dirty Picture: An uneven storyline, a blurred moral code and a jerky graph for the colourful protagonist’s character couldn’t take away from glory that Vidya Balan brought to Silk’s role. Blossoming into a formidable figure of vibrancy and voluptuary she virtually re-invented the heroine for the first time since Jaya Bhaduri, Shabana Azmi and Smita Patil. If a Dirty Picture can be so expressive we can’t wait for it to get filthy. Other remarkable films of the year: Shoaib Mansoor’s Bol, Abhinay Deo’s Delhi Belly, Anurag Kashyap’s That Girl In Yellow Boots, Nila Madhab Panda’s I Am Kalam, Neerav Ghosh’s Soundtrack, Kiran Rao’s Dhobi Ghat and Prawal Raman’s 404. 17 queries in 0.756 seconds.